General Prayut Chan-o-Cha, Prime Minister of Thailand, together with H.E. Dato Lim Jock Hoi, Secretary-General of ASEAN, visited the Thai Airways International Public Company Limited (THAI) exhibition booth at the Thailand Together event for the ASEAN Chairmanship 2019. Thai Airways International Public Company Limited (THAI), transported the 10 millionth passenger to travel from the People's Republic of China to Thailand in 2018. Thai Airways International Public Company Limited (THAI) has launched a new ?? ?Thai Airways??? mobile application, with a new look that makes the customer travel experience more comfortable and convenient. Mrs. Varangkana Luerojvong (fourth from left), Managing Director of THAI Catering, presided over the opening ceremony of THAI?? ?s Puff & Pie Bakery new branch at Gateway at Bangsue Shopping Center. Prime Minister Visits THAI Booth at ?? ?8th Celebration of Silk: Thai Road to the World 2018??? Read MorePrime Minister Visits THAI Booth at ?? ?8th Celebration of Silk: Thai Road to the World 2018??? Thai Airways International Public Company Limited (THAI) will be operating more flights to Hokkaido with an offer of special Royal Orchid Holidays (ROH) tour package from today until 31 March 2019. Thai Airways International Public Company Limited (THAI) is offering the THAI Gift Voucher during the holiday season, which is the perfect gift for New Year 2019 or any special occasion. Thai airways International Public Company Limited would like to request your kind cooperation in not presenting gifts to THAI personnel, regardless of rank or seniority, on any occasion, to promote a corporate culture of transparency. 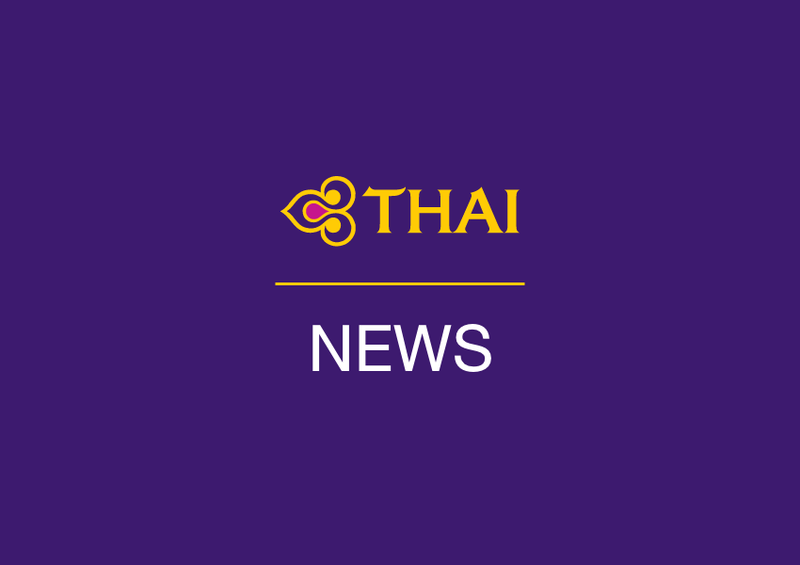 Thai Airways International Public Company Limited (THAI) has signed a memorandum of understanding with The Transport Company Limited to produce snack boxes and beverages for first class interprovincial bus passengers. THAI Offers Blankets to Monks at Royal Thai Monastery Lumbini, Federal Democratic Republic of Nepal. Read More THAI Offers Blankets to Monks at Royal Thai Monastery Lumbini, Federal Democratic Republic of Nepal. Today (3 October 2018), Prime Minister General Prayut Chan-o-cha and members of Cabinet traveled to Lamphun in support of secondary cities as part of the ?? ?Thai Tiew Thai??? Thai Airways International Public Company Limited (THAI) celebrated 30 year of flights to Nagoya, Japan with a reception based on the theme ?? ?the World is Always New with THAI,??? Thai Airways International Public Company Limited (THAI) will serve special inflight meals during Oktoberfest 2018, Germany?? ?s largest beer festival. Thai Airways International Public Company Limited (THAI) held a panel discussion on ?? ?Power of State-Owned Enterprises, Synergy to Win,??? Seen in photo is Deputy Transport Minister Pairin Chuchotethavorn during his visit to Thai Airways International Public Company Limited (THAI) to give a policy to THAI and to follow up on the company?? ?s transformation plan. Today (3 September 2018), Thai Airways International Public Company Limited (THAI) held a ceremony to welcome newly appointed president, Mr. Sumeth Damrongchaitham, who began his first day as THAI?? ?s President on 1 September 2018. Thai Airways International Public Company Limited (THAI) celebrates Her Majesty Queen Sirikit of the Ninth Reign?? ?s Birthday and Mother?? ?s Day on 12 August 2018 by offering special Mother?? ?s Day air fares on domestic flights from now until 31 August 2018. Read More???????????????????????????????????????????????????????????????????????????????????????????????????????????? ???????????????????????????????????? ??????????????????????????????????????????????????? 2561??? Mrs. Usanee Sangsingkeo, Acting President of Thai Airways International Public Company Limited (THAI), received three Skytrax 2018 World Airline Awards as the World?? ?s Best Economy Class, World?? ?s Best Airline Lounge Spa, and Best Economy Class Onboard Catering. Thai Airways International Public Company Limited (THAI) provides clarification on flight TG321 from Bangkok to Dhaka, Bangladesh on 24 July 2018, whereby the aircraft?? ?s tyre bursted while landing on the runway. THAI signed the agreement to collaborate with Rolls-Royce and explore how the two companies will work together to expand the Trent CareNetwork by building on THAI?? ?s existing Maintenance, Repair, and Overhaul (MRO) capabilities. Thai Airways International Public Company Limited (THAI) held THAI Star Day for its employees to celebrate Star Alliance?? ?s 20th Anniversary, with a photo exhibition to display milestones about Star Alliance. Thai Airways International Public Company Limited (THAI) recently launched New Gen Explorer and its new advertising campaign, as well as introduced Mr. Naphat Siangsomboon, a rising young actor, who will represent THAI?? ?s new modern corporate image for today?? ?s younger generation. Thai Airways International Public Company Limited (THAI), together with the Faculty of Medicine, Siriraj Hospital, Mahidol University, launched the charity campaign ?? ?Donate Miles to Share Happiness,??? Mrs. Usanee Sangsingkeo (fifth from left), Acting President, Thai Airways International Public Company Limited (THAI), presided over the opening of THAI?? ?s Puff & Pie Food Truck service, designed to accommodate a new generation?? ?s lifestyle.